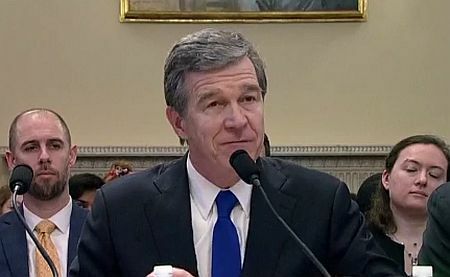 In testimony before the House Natural Resources Committee, Cooper told of mountain mudslides in western North Carolina that hurt apple growers and closed ski areas. He said high temperatures in the central part of the state have killed poultry and crops, while hurricanes and tropical storms have lashed coastal communities on the eastern shore. “We’ve weathered two so-called 500-year floods within two years,” Cooper said of the volatile weather patterns that many believe are linked to climate change. While federal funding has provided valuable cleanup and emergency services, Cooper said “when storms are becoming more fierce, it’s not enough just to pick up the pieces. He cited concerns about the price of moving to cleaner energy alternatives and funding mitigation efforts to ward against flooding and other natural disasters. “Everyone’s concerned about cost, but can we afford not to do this?” he said. He urged the panel to consider giving states greater flexibility to use disaster recovery funds. North Carolina ranked second only to California in increasing solar power usage in 2017. Cooper said that was due to forcing utilities to use more renewable energy and taking steps to limit emissions from coal-fired plants. As Policy Watch reported yesterday, however, many critics believe that the state hasn’t gone anywhere near far or fast enough in the move toward sustainable energy. For years, calls for action on climate change went unanswered by skeptical Republicans who controlled House committee agendas. But with a new Democratic majority in the House, lawmakers have promised to focus more attention on climate change in the coming months. Wednesday’s hearing was the first of six climate change-related hearings that the Natural Resources Committee and its subcommittees plan to host in February. In a statement on Tuesday, committee Chairman Raul Grijalva, (D-Ariz.) said President Trump’s failure to address climate change in his SOTU speech spoke volumes. But Rep. Rob Bishop, (R-Utah), the committee’s ranking member, expressed his frustration with the hearing schedule because he said Democrats haven’t provided a stated goal in terms of possible legislation. Bishop also said issues of climate change are best handled by other committees. Democrats’ heightened focus on climate change was evident at Tuesday’s State of the Union address, where many Democratic lawmakers brought climate change experts and advocates as their guests. Gene Karpinski, executive director of the League of Conservation Voters, was the guest of Rep. Paul Tonko of New York. Tonko is the new Democratic chairman of an Energy and Commerce subcommittee that focuses on climate change. Rep. Chellie Pingree (D-Maine) brought former Trump administration whistleblower Joel Clement, who resigned from the Interior Department in 2017 after questioning the impact of climate change on Alaskan natives. And Sen. Ed Markey, (D-Mass. ), brought Varshini Prakash, a Boston activist who helped launch the Sunrise Movement, which is organizing young people in the fight against climate change. Markey and Rep. Alexandria Ocasio-Cortez, (D-N.Y.) are expected to introduce legislation calling for a “Green New Deal,” which the Sunrise Movement has advocated for. That proposal is expected to call for increasing the use of renewable electricity, cutting industrial use of fossil fuels and committing to U.S. leadership in the fight against climate change on a global level. Sunrise members will be visiting Congress next week urging lawmakers to support the resolution. In addition to Cooper, Massachusetts Gov. Charlie Baker, a Republican, also testified at the committee hearing Wednesday, which examined the effects of climate change on local communities. At the same time, the Energy and Commerce subcommittee chaired by Tonko was hosting a separate hearing that looked at the economic impact of climate change. Coincidence or collusion? NC Oil and Gas Commission receives curious requests to frack.